Welcome Aboard! Join us for a fun-filled motor coach vacation full of spectacular scenery, holiday cheer and yuletide spirit in "The Music Capital of the World," Nashville, Tennessee. Before checking into the Fairfield Inn & Suites in Knoxville, Tennessee for the night, we are treated to a delicious dinner at a Cracker Barrel restaurant. After a deluxe continental breakfast, we depart for Nashville, Tennessee. 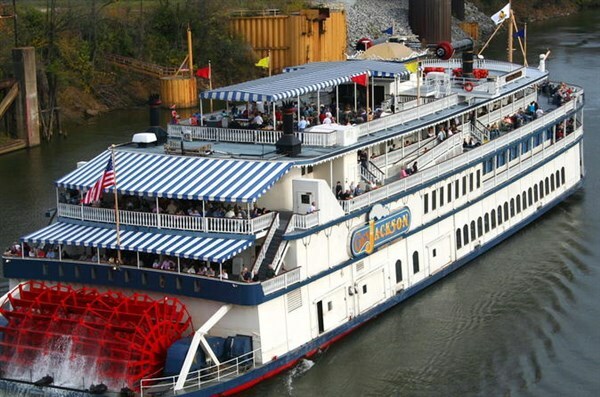 Upon our arrival, we climb aboard the General Jackson Showboat, an authentic paddlewheel riverboat. Our 2-hour lunch cruise down the Cumberland River includes a country music holiday show for your entertainment. Following our cruise, we check into the world-famous Gaylord Opryland Resort, and our Atrium Garden View accommodations for the next three nights. 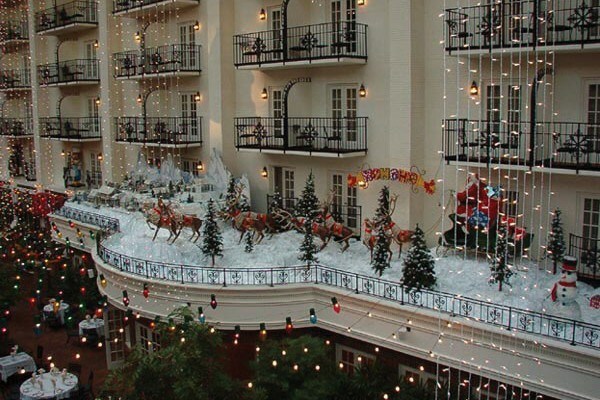 Each year the Opryland Resort is decorated with 2 million twinkling lights, acres of larger-than-life decorations, thousands of poinsettias and decorated trees which transport you into a musical paradise and a land of enchantment! Enjoy the beautiful view from your private balcony and marvel at the splendor and elaborate holiday décor of this fabulous world class resort. You will have some time to sit, relax and freshen up before going out for a festive holiday dinner and a live performance by country music superstar Trace Adkins at the Wildhorse Saloon. After a buffet breakfast, we meet our step-on guide, and depart for a tour of Nashville. We will learn about Nashville's colorful history and beautiful architecture, drive by the Tennessee State Capitol, world famous Music Row, and through a residential area viewing the homes of country music royalty, as well as the Governor's Mansion. Your tour will also include admission to the Parthenon. The Parthenon in Centennial Park is a full-scale replica of the original Parthenon in Athens, Greece. It was designed by Confederate veteran William Crawford Smith, and built in 1897 as part of the Tennessee Centennial Exposition. Today the Parthenon, which functions as an art museum, stands as the centerpiece of Centennial Park, a large public park just west of downtown Nashville. Next, we visit Music Row, Printers Alley and downtown Nashville for shopping and lunch on your own. Here, you will find an exciting nightclub scene offering honky-tonk bars, including world famous Tootsie's Orchid Lounge, restaurants, local stores, shops, and boutiques, all conveniently located within walking distance of each other. Following lunch, we return to the Gaylord Opryland Resort where you can explore this grand Nashville landmark. Enjoy creating your own adventure as you stroll under the majestic, climate-controlled glass atriums, surrounded by nine acres of lush indoor gardens, winding rivers and pathways, and sparking waterfalls. Or you may simply wish to sit, relax and experience the serenity of this spectacular resort from your balcony room. Tonight we have a dinner & show at Nashville's newest "must see" entertainment attraction, Ray Stevens CabaRay Showroom. After a buffet breakfast, you are free to design the rest of your day and do as you wish! The Opryland Resort offers you a wide variety of attractions that are included for you to enjoy and create a day of adventure and exploration on your own. Admissions to ICE!, a fantastical, indoor winter wonderland entirely hand-carved out of ice and celebrating the spirit of Christmas and the Delta River Flatboat ride down the scenic indoor river are all included for you to enjoy at your leisure. So, unwind, explore, shop, dine and be entertained to your heart's desire amidst this Christmas wonderland! Tonight, dinner is on your own. We end the day on a musical note by attending an evening performance of the Grand Ole Opry Show at the "Mother Church of Country Music," the Ryman Auditorium. After a buffet breakfast settle back, relax and enjoy the mountain scenery on our drive to Asheville, North Carolina. Following our check in at the Brookstone Lodge, our hotel for the night, you will have time to unwind and freshen up before enjoying tonight's special event! We begin with a delicious dinner served at the Moose Café, a Southern Style family restaurant that uses fresh local ingredients to serve country favorites. 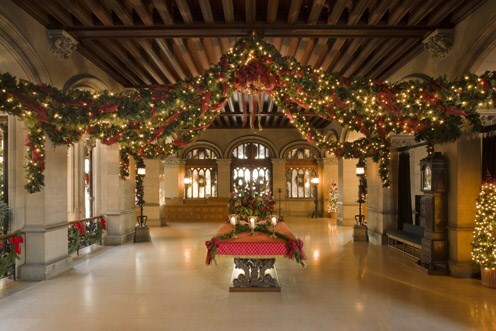 Next, we take part in a magical holiday celebration, Christmas at the Biltmore Estate by glow of candlelight. 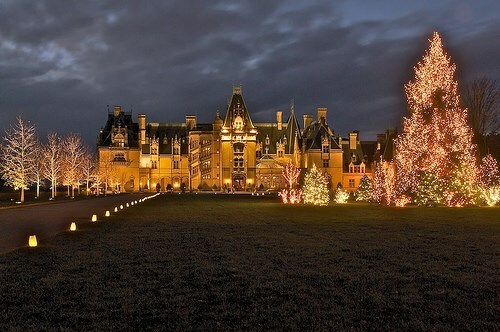 Experience the spectacular recreation of a 19th-century Christmas at George Vanderbilt's 250-room French chateau. The mansion will be decorated with more than 35 magnificent trees to view and the sound of singing choirs and chamber music will fill the air! After a buffet breakfast settle back for a relaxing hand-clappin', toe-tappin', good time ride home, while reminiscing about Opryland's yuletide sights, sounds, lights and a delightful country Christmas - Nashville Style! Happy Holidays!